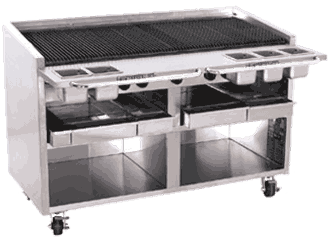 Floor model cabinet style charbroiler is designed for high volume charbroiling in natural or LP gas. Radiants and Glo-Stones are interchangeable without tools and may be mixed and matched on the same broiler. High performance, clogproof, aluminized steel H burners are rated at 36,000 BTUH each and located approximately every 4”. Each burner features a separate, independent, operator-controlled valve with a stand-by position. Standard grates are fabricated of ½” diameter steel floating-rods. Each grate may be adjusted independently in any of four tilting positions. Heavy duty stainless steel exterior, interior and combustion chamber. Broiler cabinet construction is double walled with fully insulated sides, back and bottom. Additional Fajita grates, per 12" +$351.75 Additional Flat/cast iron grates, per 6" +$109.72 Additional Floating rod grates, per 6" +$109.72 Additional Griddle plates, in-line - 10-1/2" wide +$1,204.35 Additional Meat grates, per 6" +$109.72 Fajita grates in lieu of standard, per 12" +$305.02 Flat/cast iron grates in lieu of standard Griddle plate, in-line - 10-1/2" wide, in lieu of standard grate +$1,128.22 Griddle plate, lift-off - 10-1/2" wide +$364.35 Griddle plate, lift-off - 16" wide +$288.75 Meat grates in lieu of standard, per 6"